Full Scores [DVD-ROM] matching the individual instrumental parts for the 46 orchestral works included in Volume 7: Ravel, Elgar and more. Scores contain the same rehearsal numbers as the individual parts so that purchasing both results in a complete set of performing materials for all works included in a particular volume. 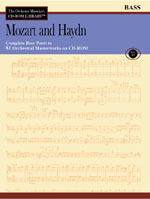 Full Scores [DVD-ROM] matching the individual instrumental parts for the 81 works included in Volume 6: Mozart and Haydn. Scores contain the same rehearsal numbers as the individual parts so that purchasing both results in a complete set of performing materials for all works included in a particular volume. 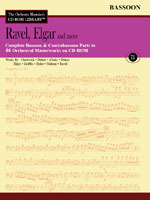 INCLUDES: HAYDN 23 Symphonies plus The Creation and The Seasons. MOZART 16 Symphonies; 14 Piano Concertos; 3 Violin Concertos; 8 Opera Overtures, plus Serenades, Requiem, Masses. Join our mailing list to receive updates on new volumes in the Orchestra Musicians CD-ROM Library™ series.